Others throw OK, but this one WINS! The head is cast in 4140 steel and shows the hammer marks from the forger. It's the only cast head that looks period correct. It has a 4 inch cutting edge and is 6 5/16" long. The slightly longer length adds years to its life of service. The eye is a perfect taper, replacement handles are easy to fit and available from me or at most shops that carry Black Powder Items. The hickory handle is about 181/2" long. 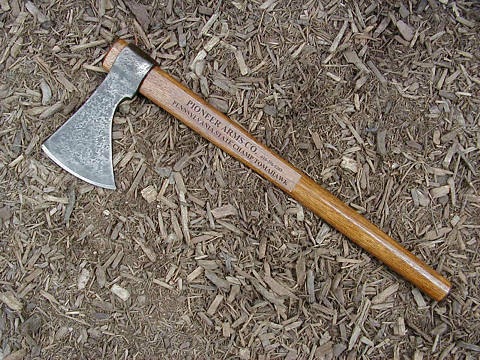 Your hawk comes complete with a stained and finished handle, sharp and ready to win at your next event. Note: The label is only on the ones I sell at shows, not mail order. COST $56.50 postage and insurance paid. Handles are $7.50 with tomahawk or $9.50 sent separately.